That day we were admiring the beauty of Tatras seen from our flat on 17th floor in Katowice city. Such clear air happens once a year in the mid of the winter after frizzy night when the air is very very dry. It must be in the early sunrise time when the sun is behind the peaks, casts the shadow on the slope and brightens the sky above. Tatra mountains are located 140 km away in straight line from Katowice. 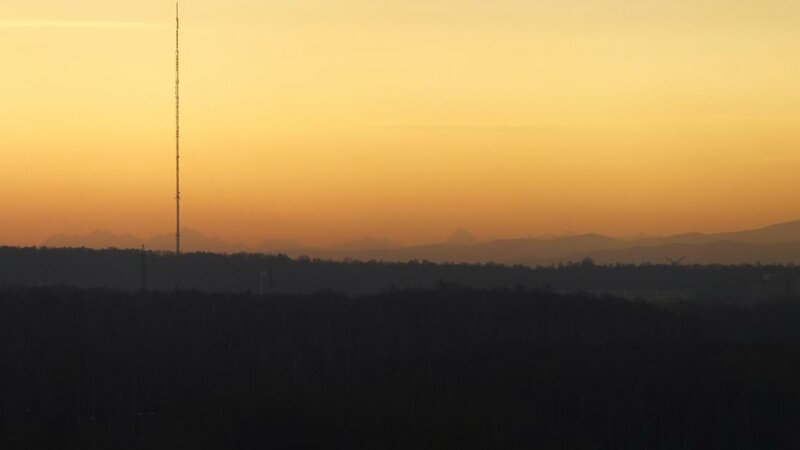 The high antenna seen in foreground is actually the highest structure in Poland. It's 358.7 meters tall and was built in 1976.